Breaking the Rules at The Grand Canyon — The Hungry Gypsy: A Personal, Health, Food and Travel Blog. 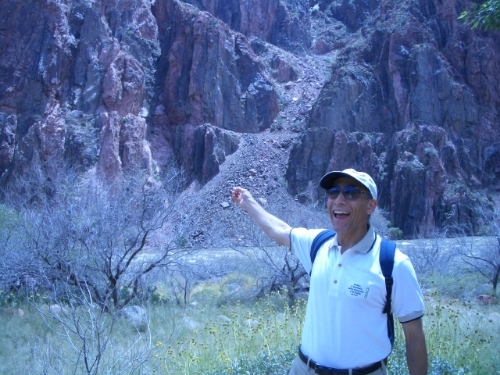 In 2008 my father and I hiked the entire Grand Canyon, South Rim down to Phantom Ranch and back, in ONE day. Which, for the record, you are not supposed to do. It really is not a very wise thing to do. I certainly do not recommend it for anyone who is not a serious hiker. Fortunately, I happen to be a crazy hiker and my Dad is still an avid cross country runner, so we were able to do it. We are certainly not the only ones to have done this, but it is firmly NOT recommended. Of course, the original plan was not to do it all in one day. Hiking the Grand Canyon has always been on my Dad's bucket list. In 2008 he was in his late fifties and thought he should do it now before getting any older. Knowing that I was an fervent hiker, he thought I would be up for doing it with him. Which I was. Unfortunately, my Dad being my Dad, had this great idea and wanted to plan it for the near future. He had a business trip in Texas in a few months, so he figured he would then take a hopper over to Arizona and I could fly in from LA and meet him at the airport. We would rent a car and drive to the South Rim, spend the night on the rim, hike down to Phantom Ranch, spend the night at the ranch and then hike back out the next day. As it turns out, Phantom Ranch, being small and the only option down at the bottom of the canyon, books up about a year out. Sooo....now we were going to hike the entire thing in one day. Going down was actually very easy. Which was somewhat surprising because as any avid hiker will tell you, uphill is way better than downhill. Uphill may be tiresome, but downhill is hell on your knees and ankles. Luckily, the South Rim path isn't particularly steep so the down hill section was pretty gentle on our joints. We made it down to the river and Phantom Ranch in 3 hours. Down at the tiny little ranch, we ate lunch and relaxed for a bit. Which is good because we wanted to get going back fairly soon since it was starting to get hot. There is a huge temperature difference between the rim and in the canyon. It gets way hotter further down. We set off fairly early in the morning so we were currently fine, but we knew if we lingered down at the Ranch, our hike back up would not be pleasant. Going back up took double the time. 6 hours. Therefore, our total hiking time for the day was 9 hours. Going up was rather exhausting. By midday there was no shade to be found. We were hiking uphill for 6 hours straight under the blazing sun. This is why your average visitor should not attempt the all-in-one-day trek. By the end we were spent. Despite our intense desire to collapse as soon as we made it back to the rim, it was a fantastic experience that I loved getting to share with my Dad. We had a great time and felt a massive sense of accomplishment when we got back. After showering, we made our way to one of the restaurants on the rim for dinner. Sitting on the wooden booth my Dad commented that he had never been this sore in his entire life. He looked dog-tired, as I'm sure I did too, but we both still had goofy grins on our faces. Pride in accomplishment. To this day this one of my Dad's and my proudest achievements. We are so glad we did it. I'd happily do it over, but my Dad says "Never again." He's in his 60's now so I suppose that's fair. Either way, we did it.